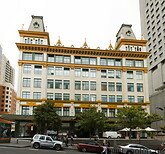 The Central Business District in central Sydney, often referred to as the CBD, is the main commercial area of Sydney. 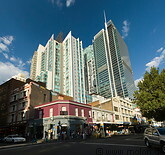 The CBD is home to many of Australia's tallest skyscrapers. Many Australian and international companies have headquarters or offices here. The district contains a number of pedestrian areas and shopping centres and many restaurants.